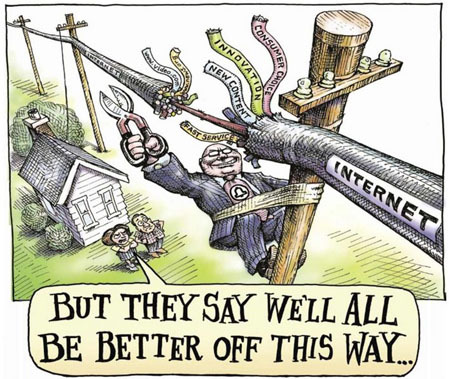 Internet is neutral, according to the American FCC, How long? On 03/04/2015 03/12/2015 By AndSoft Software Gestión Transporte TMSIn NET NEUTRALITY HOW LONG? Madrid, 04, March, 2015.- The Federal Communications Commission voted Thursday to regulate broadband Internet service as a public utility, a milestone in regulating high-speed Internet service into American homes. The new rules, approved 3 to 2 along party lines, are intended to ensure that no content is blocked and that the Internet is not divided into pay-to-play fast lanes for Internet and media companies that can afford it and slow lanes for everyone else. Those prohibitions are hallmarks of the net neutrality concept. We publish the reactions of three different newspapers, the United States and Europe: The Guardian, The New York Times and The Washington Post. Internet activists scored a landmark victory on Thursday as the top US telecommunications regulator approved a plan to govern broadband internet like a public utility. 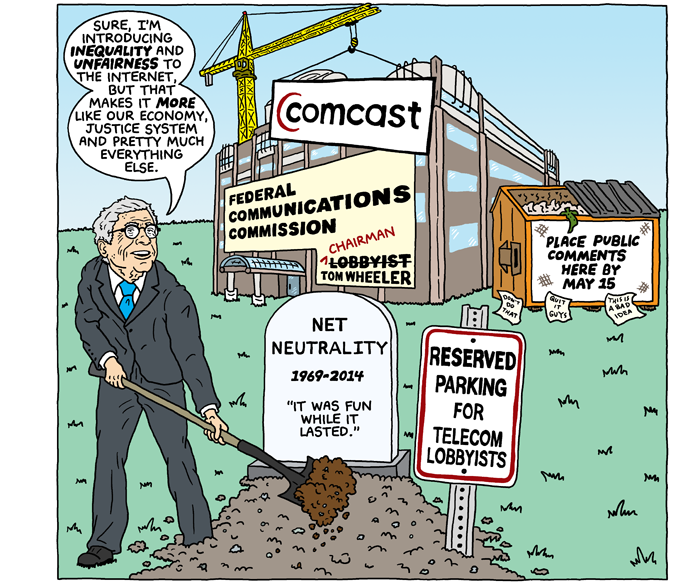 Following one of the most intense – and bizarre – lobbying battles in the history of modern Washington politics, the Federal Communications Commission (FCC) passed strict new rules that give the body its greatest power over the cable industry since the internet went mainstream. FCC chairman Tom Wheeler – a former telecom lobbyist turned surprise hero of net-neutrality supporters – thanked the 4m people who had submitted comments on the new rules. “Your participation has made this the most open process in FCC history,” he said. “We listened and we learned.” Wheeler said that while other countries were trying to control the internet, the sweeping new US protections on net neutrality – the concept that all information and services should have equal access online – represented “a red-letter day for internet freedom”. “The internet is simply too important to be left without rules and without a referee on the field,” said Wheeler. 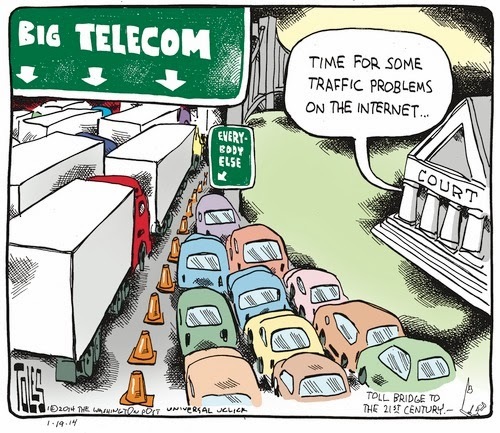 “Today’s order is more powerful and more expansive than any previously suggested.” Broadband providers will be banned from creating so-called “fast lanes” blocking or slowing traffic online, and will oversee mobile broadband as well as cable. The FCC would also have the authority to challenge unforeseen barriers broadband providers might create as the internet develops. Activists and tech companies argue the new rules are vital to protect net neutrality – the concept that all information and services should have equal access to the internet. The FCC’s two Republican commissioners, Ajit Pai and Michael O’Rielly, voted against the plan but were overruled at a much anticipated meeting by three Democratic members on the panel. Tim Berners Lee, inventor of the world wide web, addressed the meeting via video, saying he applauded the FCC’s decision to protect net neutrality: “More than anything else, the action you take today will preserve the reality of a permission-less innovation that is the heart of the internet.” “It’s about consumer rights, it’s about free speech, it’s about democracy,” Berners Lee said. Clyburn compared the new rules to the Bill of Rights. “We are here to ensure that there is only one internet,” she said. “We want to ensure that those with deep pockets have the same opportunity as those with empty pockets too succeed.” The fight for net neutrality has been largely fought online. The millions of messages were sent to the FCC during its comment period on the rules beforeThursday’s landmark series of votes. Last year the FCC looked set to approve rules that would have allowed internet service providers to create “fast lanes” on the internet. Critics charged such a move would create a two-tiered internet and stifle competition. Tiffiniy Cheng, co-founder of internet advocacy group Fight for the Future, said: “This is our free speech struggle in the digital age. Institutions of power should know by now: Internet users will not stand idly by while anyone tries to take their freedom away. The FCC passed two new orders on Thursday. Mobile data service for smartphones and tablets is being placed under the new rules. The order also includes provisions to protect consumer privacy and to ensure Internet service is available for people with disabilities and in remote areas. But the new rules are an à la carte version of Title II, adopting some provisions and shunning others. The F.C.C. will not get involved in pricing decisions or the engineering decisions companies make in managing their networks. Opponents of the new rules, led by cable television and telecommunications companies, say adopting the Title II approach opens the door to regulatory meddling in the future and will deter investment and ultimately harm consumers. They plan to challenge the F.C.C. order in court. Supporters of the Title II model include the major Internet companies, start-ups and many public interest groups. The Federal Communications Commission approved strict new rules for Internet providers Thursday in a historic vote that represents the government’s most aggressive attempt to make sure the Web remains a level playing field. The rules would dramatically expand the agency’s oversight of the country’s high-speed broadband providers, regulating them like a public utility. They were adopted by a 3-to-2 margin with the commission’s Republican members voting against them. Under the rules, it will be illegal for companies such as Verizon or Cox Communications to slow down streaming videos, games and other online content traveling over their networks. They also will be prohibited from establishing “fast lanes” that speed up access to Web sites that pay an extra fee. And in an unprecedented move, the FCC could apply the rules to wireless carriers, such as T-Mobile and Sprint, in a nod to the rapid rise of smartphones and the mobile Internet. “This is no more a plan to regulate the Internet than the First Amendment is a plan to regulate free speech,” said FCC Chairman Tom Wheeler. “They both stand for the same concept: openness, expression and an absence of gatekeepers telling them what they can do, where they can go and what they can think.” The proposed regulations reflect more than a year of deliberation by the FCC and a surprising turnaround by Wheeler, a former cable industry lobbyist, who had initially supported a proposal that was much friendlier to Internet providers. It’s also a significant victory for consumer advocates, grass-roots organizers, Internet companies and Democrats, all of whom spent months pressing for what President Obama called “the strongest possible rules” on net neutrality. “Providers here in the United States have in fact blocked applications on mobile devices, which not only hampers free expression but also restricts competition and innovation by allowing companies, not the consumer, to pick winners and losers,” said Democratic FCC Commissioner Mignon Clyburn. Internet providers have signaled that they are likely to challenge the rules in court, while conservative lawmakers have slammed them as a government takeover of the Internet and vowed to overturn them. “We have never argued there should be no regulation in this area, simply that there should be smart regulation,” James W. Cicconi, AT&T senior executive vice president of external and legislative affairs, said in a blog post. “What doesn’t make sense, and has never made sense, is to take a regulatory framework developed for Ma Bell in the 1930s and make her great grandchildren, with technologies and options undreamed of eighty years ago, live under it.” Brewing presidential politics could pose another threat to the long-term viability of the rules. Should a Republican win the White House in 2016, analysts and industry lobbyists say, a GOP-led FCC could decide to reverse any regulations passed by Wheeler’s commission. Republican FCC Commissioner Ajit Pai slammed the rules as an attempt to “micromanage” the Internet. 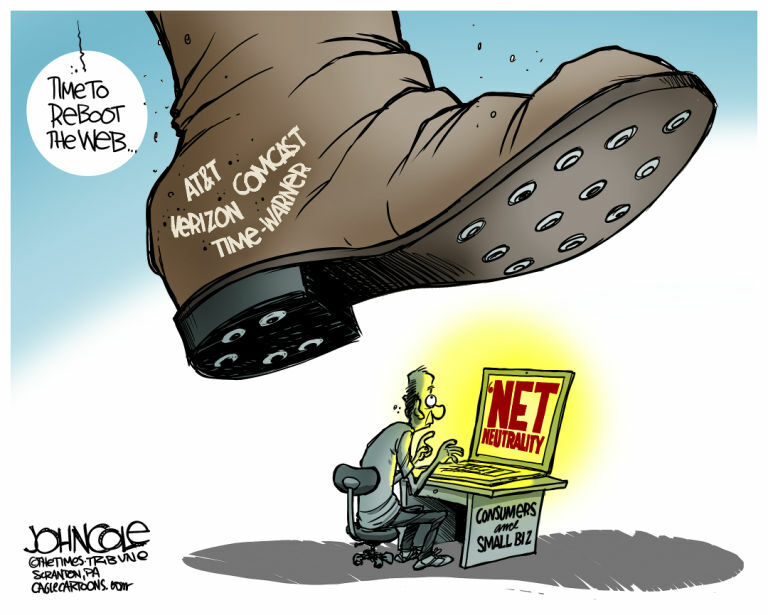 “President Obama’s plan to regulate the Internet is not the solution to a problem. His plan is the problem,” said Pai, warning that the regulation would “let a Washington bureaucracy — and not the American people — decide the future of the online world.” The FCC opted to regulate the industry with the most aggressive rules possible: Title II of the Communications Act, which was written to regulate phone companies. The rules waive a number of provisions in the act, including parts of the law that empower the FCC to set retail prices — something Internet providers feared above all. All cartoons published in this report belong to different media artists. Reblogged this on CLARA FERNÁNDEZ.